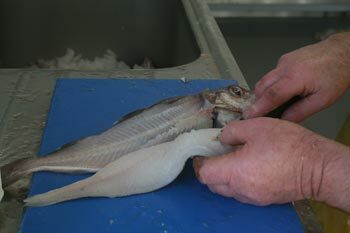 We can supply fish to suit your requirements including whole fish, headed and gutted, filleted or portioned. We can also supply fresh or cooked lobsters from GWB Costie, locally caught in clean Orkney waters for the freshest and finest lobsters. We smoke our own fish on the premises, tended with care from start to finish to ensure the finest quality. We don't add dyes, just time! We smoke, haddock, cod, mackerel and herring salmon to name a few. If it swims Kevin will smoke it for you! Just contact us to discuss your requirements. Morpol provide a regular supply of beautiful fresh Westray farmed salmon to a high standard. You must try our smoked salmon, yummy! We also get lovely fresh salmon for smoking from Shetland. Scallops are supplied by local boat "Maggie J" and local divers. Caught in the crystal clear waters around Orkney you can be sure of their quality. We offer a small range of cooked products through the local shops in Westray and of course at "JACKS"